With voting in the Football Boot Awards closing in just over a week’s time (Tuesday 16th October), this week we review each of the individual voting categories. Today, the Football Boot of the Year! The Football Boot of the Year is the standout category, with each brand nominating their leading football boot, hoping that it will be voted the best boot in the football boot business. 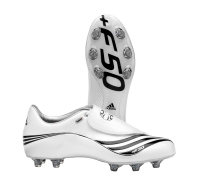 The Adidas F50 Tunit 2 was chosen as Adidas’ nomination ahead of the Predator Absolute. The Tunit 2 football boot allows each player to tune their football boots depending on the weather, pitch conditions or their own personal style. The ‘Pro Lite’ set up is favoured by many players, offering them increased speed and agility by reducing the overall weight of the boot. The lightweight synthetic climacool upper combined with the comfort chassis gives you a football boot with added breathability, comfort and superior touch. Adidas F50 Tunit 2 wearer Salomon Kalou scored the winner at the Reebok Stadium yesterday to give Chelsea a 1-0 victory against Bolton. Hummel’s 8.4 Pio Sport FGX was apparently inspired by luxury fashion goods, Danish modern furniture, and graphic print wallpaper! As a limited edition lightweight football boot, only 2000 pairs have been produced worldwide. Ajax’s flying winger Dennis Rommedahl, who runs an amazing 10.2 seconds over 100 metres, has been quick enough to grab himself a few pairs! A unique feature of the Hummel nominated football boot is its hmlFIT Customised Fit Technology heat mouldable sockliner. This allows the wearer a customised fit, producing maximum surface contact with the foot, ensuring fewer pressure points, and improved performance and control. The Lotto Zhero Gravity is a lace free, lightweight football boot which took three years to develop, with a 1 million pound investment! ‘Project Zhero’ has adopted extreme technology to create a football boot made for speed, comfort and agility. The first laceless football boot on the market, the Zhero Gravity provides excellent shooting precision and close sensitivity for control. Free scoring Italian striker Luca Toni, who has bagged 7 goals in 8 games since joining from Fiorentina for 11 million euros last summer, is Lotto’s leading football boot endorsee . The Mitre Vortex Pro was worn by Fulham’s Franck Queudrue during the 2006-2007 season. The upper boasts waterproof vents and has the smallest low cut chassis making it one of the lightest and most breathable boots on the market. Asymmetric micro lacing and a breather tongue further enhances the football boot’s credentials. The external heel unit is made from Thermal Plastic Urethane (TPU) for extra stability and a shock impact insole gives good foot to ground comfort. The Mizuno Morelia was designed to improve comfort, touch, feel and flexibility. The upper is made of precision crafted supersoft waterproof kangaroo leather, with a flip over tongue. The multi stud pattern helps increase stability and traction. The Morelia is worn by Inter’s Javier Zanetti and Mizuno also count Romania’s Adrien Mutu and Argentinian Pablo Aimar amongst its endorsees. Nike’s Total 90 Laser has a large ‘sweet spot’, maximising shooting and passing accuracy through precision rings which control ball spin and trajectory. The rings have been sectioned to help add more aggressive contact to the ball, enabling the player to add height and swerve to the ball as desired. The waterproof eVent fabric allows improved breathability, whilst maintaining a constant temperature in the football boot. Nike has fared well in the scoring charts this past weekend, with Robbie Keane (Spurs), Fernando Torres (Liverpool), Elano (Man City), Ben Hutchinson (Middlesbrough) and Wayne Rooney (Man Utd) all notching in the Total 90 Laser. The Puma v.106’s last and lace wrap system moulds the upper to the contours of your foot. The weight is reduced by the insertion carbon fibre plate, whilst adding improved pressure distribution. The outsole integrates with the anatomical stud positioning and pointed soft ground studs, designed to offer the best grip, manoeuvrability and rear foot stability. If control is paramount, then the thin upper offers a great deal of feel. England strikers Peter Crouch and Dean Ashton both wear the Puma v.106. 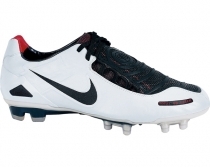 The Umbro X Boot III is perhaps most well known for being Michael Owen’s football boot of choice. The Newcastle and England striker made a swift return from stomach surgery to score in his Umbro football boots‘ in United’s 3-2 home victory against Everton. Research at Liverpool’s John Moores University showed that the Umbro X Boot III football boot provides 90% better grip than the competition in lightly damp conditions across a range of ball speeds. 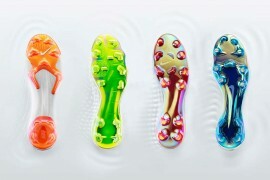 In addition, the Umbro X Boot III football boot gives 9% better grip in dry conditions. 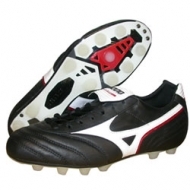 Overall, the tests showed that the football boot achieved better grip results than its rivals at every speed and every condition. Umbro’s touch control technology is powered by proven Michelin performance with Umbro’s enhanced Motion Control Sprint Last, whilst the Umbro wishbone technology, with added titanium construction, allows for a football boot providing superior support and strength. Remember if you haven’t voted already, vote now for your favourite football boots and give yourself a chance of winning the top prize of a signed pair of John Terry Umbro X Boot Destroyer’s and a runner up prize of a pair of football boots each season for the next five seasons! The Addidas F50 Tunit 2 wins, complimenting a stylish look with lightweight design.